Spacious and relaxing Bed & Breakfast in the beautiful Normandy Countryside. A ground floor room with easy access (16.5m sq), private shower and WC (ensuite) doors to an outside sitting area with views over the Normandy countryside. 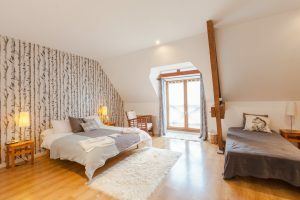 A first floor room (18.5m sq) with double bed and full sized single bed if required, private shower and WC (en suite), seating area with views over the Normandy Countryside. 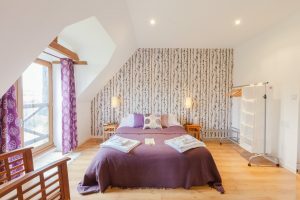 First floor room (18.5m sq) with double bed, private shower and WC (ensuite) and option of one or two additional full size single beds; seating area with views over the Normandy countryside. 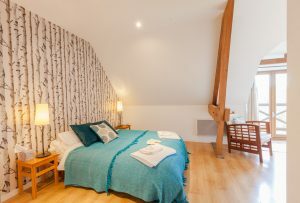 First floor room with double bed, private shower and WC (ensuite) and option of additional three full sized single beds. Seating area with views of our grounds. 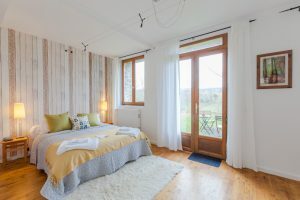 Contemporary en-suite Bed and Breakfast accommodation in a tranquil woodland setting in the beautiful Normandy countryside. We have four en-suite rooms which can accommodate up to 13 people in total. Guests have access to a sitting and dining area and are welcome to use the kitchen facilities for complementary drinks or preparing light meals if you choose not to go out. Free WIFI is available. Whether you are looking for a short break, a stop off point, or longer holiday we can offer high quality accommodation. Normandy Inn is within easy travelling distance of ferry ports, tourist attractions and activities. If you just want to relax, you are welcome to explore our network of woodland paths. Lovely secluded spots to sit and picnic, or contemplate the peace. See if you can spot the fish and newts in our ponds, dragonflies, birds and other wildlife. At night-time, take advantage of the lack of light pollution to marvel at the stars on a clear night. This year is the 75th anniversary of the D- Day Landings and Normandy Tourism has planned a summer of events in commemoration, you can find out details of all the events here. We are already fully booked for the first two weeks of June however if you are planning to visit its always worth a phone call or email to discuss your specific requirements. If we can help, we will! If the specific dates you are looking for are not showing as available on the booking calendar please contact us directly as we may still be able to help. We can offer you 20% discount if you are travelling with Brittany Ferries if you book to stay with us. Brittany Ferries sails to both Cherbourg and Caen from the UK. 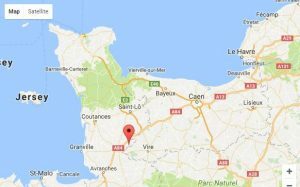 Caen is just an hour away from Le Val Borel and Cherbourg less than 2 hours drive from the ferry. 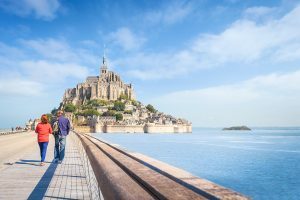 Le Val Borel is ideally situated in the Normandy Countryside, perfect for visiting the D-Day Landing Beaches and the world famous Mont St Michel. An important part of your stay is the breakfast. At le Val Borel we provide a continental breakfast for you to enjoy with a wide selection that may include bread, pastries, cereals, fruit, cold meats, cheese etc. Whilst enjoying your relaxing stay at the Val Borel you might want to venture out to discover Normandy’s rich history, enjoy watersports or cycling, or visit local cider, calvados or cheese producers. Normandy has something for everyone.